Now that Script Debugger 5 has been released, and most of the fires have been put out, I am turning my attention to new projects. As part of this I have been doing a lot of reading and experimenting with Android and iOS development. I realize I’m late to the party with iOS/Android development, but Mac OS work has kept my busy. I finally decided to get my feet out of the mud and build something useful. 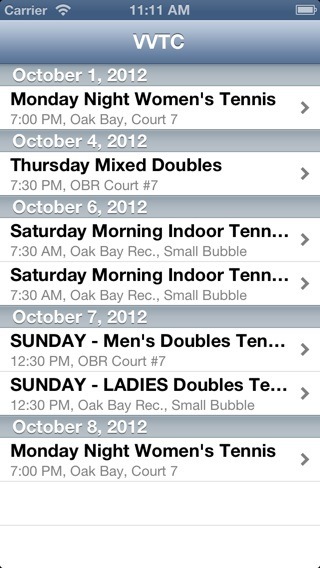 I chose as my first significant iPhone app a client for the Victoria Virtual Tennis Club. This is a PHP/MySQL based web site which I developed to help this organization host Tennis matches in the Victoria B.C. area. Like most desktop developers moving to mobile, I’m struggling to keep things simple on iOS and adopt the UI idioms users have come to expect and understand. I’m sure I’ll find ways to simply this app after I’ve had time to play with it. Taping on an event in the master screen takes you to a detail screen where you can see event details, a list of participants and then sign up for the event if you want to. Behind the scenes, this involved adding a simple REST service to the VVTC web site to get the current calendar information, and to request signup. This data is returned as a JSON structure. I decided to avoid the various iOS REST frameworks I found, and simply roll my own since I only have two URLs (get calendar, request signup). This decision may haunt me in the future, but for now things are working and I can understand what’s going on. The new NSJSONSerialization class worked flawlessly with the data returned by PHP’s json_encode function. Dealing with dates was a bit of an issue, but I finally settled on the ISO 6801 date format and that problem was solved. Going forward, I want to add a Month view that mimics Apple’s Calendar application using the Kal project as an alternative to the list view I currently have. Matt Neuburg‘s new “Programming iOS 5” book. This book explained lots of things for me, but most importantly it allowed me to adopt ARC along with a lot of Objective-C 2 features in my iPhone app. After many years of doing manual memory management in Script Debugger, it took a lot to let go of the rains and trust this to the compiler. This exercise has kind of spoiled me for dealing with my old code. I read the first edition of Matt’s book cover-to-cover a few years ago and that gave me my basic understanding of the iOS SDK. A lot has changed over the years, and the new version of the book was great at reacquainting me with the iOS SDK. Erica Sadun‘s “The iOS Developer’s Cookbook“. Lifting pieces of Erica’s code out of her examples saved me a bunch of time. The QuickDialog project. I used this to build all the detail views in my app and it saved me a mountain of time. There are many web sites offing directories of reusable iOS (and Mac OS) UI components, but I recently found Cocoa Controls. This site led me to stumble upon QuickDialog and a number of other useful things. UPDATE: I am missing Cocoa Bindings under iOS. I know that iOS provides Key Value Observing, but Bindings are missing. How are others dealing with this omission?